Presumably on behalf of Ergon Energy, conducting aerial survey work out of Hervey Bay / Fraser Coast Airport for several days during the middle part of December was Australasian Jet ROAMES Cessna 206H Stationair VH-FEN and VH-XBF, however, we are unable to confirm exactly when the Ausjet Stationair's arrived or how long they operated in the region. But, what we can confirm is VH-XBF suffered an unfortunate incident during this time resulting in a partially collapsed nose-wheel while landing after completing an aerial survey mission. The extent of damage and how long the aircraft remained (or remains) out-of-service is not known. Of interest, ROAMES is Ergon Energy’s Remote Observation Automated Modelling Economic Simulation technology which employs geospatial mapping techniques with cutting-edge artificial intelligence and cloud computing capabilities. Compiled at sub centimetre-level accuracy, complex 3D objects like structures, utility poles, attachments and wires, trees and streetlights are produced at scale and visible within the virtual world. 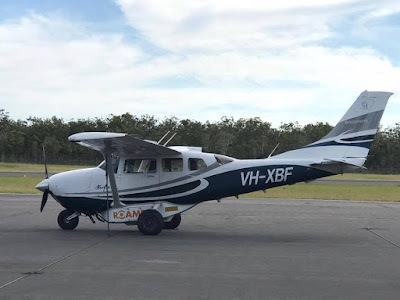 Meanwhile, Bundaberg planespotter Dan B has forwarded more photos, this time featuring Bontrail / Stahmann Farms Cessna 208 Caravan VH-SJJ captured soon after making a morning arrival at the rum city from Toowoomba on Thursday 21 December. Spending most of the day parked at Bundaberg, VH-SJJ eventually departed back to it's Toowoomba base during the afternoon.